La Belle Fleur florist shop has been working hard for twenty-five years to bring the most beautiful, highest quality flowers to Santa Rosa, and it takes lots of work! We carefully choose all of our flowers at the San Francisco Flower Market, arriving in the middle of the night to ensure the widest variety and freshest product. We then skillfully handle the flowers, processing properly so that our flowers will last the longest possible time in your home. 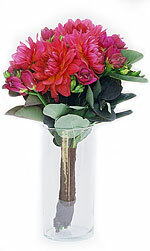 Our creative floral designers can combine any colors or blossoms that your heart desires. We can create the most festive, beautiful, reverent or irreverent floral designs and accents for any occasion. If you can dream it, we can create it. If you can’t dream it, we can dream it for you. Our shop delivers daily throughout Santa Rosa and for special events, we travel all over Sonoma County and also Marin, Napa, San Francisco and parts of Mendocino Counties. As a small shop, we are extremely attentive to detail and design, and are able to offer you all the personal attention that your order deserves. After all these years, we still love flowers and will do all that we can to make you feel the same way. 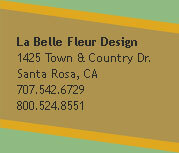 Let La Belle Fleur be your first choice for flowers.